This PDF 1.6 document has been generated by PScript5.dll Version 5.2.2 / Acrobat Distiller 11.0 (Windows), and has been sent on pdf-archive.com on 20/04/2016 at 18:24, from IP address 204.146.x.x. The current document download page has been viewed 251 times. File size: 165 KB (32 pages). See United States v. Detroit Timber &amp; Lumber Co., 200 U. S. 321, 337.
another.” §924(e)(2)(B)(ii). In Johnson v. United States, 576 U. S.
___, this Court held that clause unconstitutional under the void-forvagueness doctrine. Eleventh Circuit then denied Welch a certificate of appealability. retroactive application of Johnson to his case. effect in cases on collateral review. Pp. 6–15. proceeding must make “a substantial showing of the denial of a constitutional right.” §2253(c)(2). That standard is met when “reasonable jurists could debate whether . . . the petition should have been resolved in a different manner.” Slack v. McDaniel, 529 U. S. 473, 484.
obtain relief in his collateral challenge to his sentence. Pp. 6–7. any valid criminal statute. Pp. 10–15. joined. THOMAS, J., filed a dissenting opinion. year in prison—from possessing a firearm. 18 U. S. C.
five years longer than the law otherwise would allow. explosives, or otherwise involves conduct that presents a serious potential risk of physical injury to another.” §924(e)(2)(B). clause that Johnson held to be vague and invalid. offense of failure to report to a penal institution); Sykes v.
the Fourteenth Amendment (with respect to the States). determined that the residual clause could not be reconciled with that prohibition. of the crime.” 576 U. S., at ___ (slip op., at 12). “the use of force, violence, assault, or putting in fear.” Fla.
1996 Florida case tracked that statutory language. App. grabbed a gold chain from his neck. violent felony both under the elements clause, 18 U. S. C.
§924(e)(2)(B)(i), and the residual clause, §924(e)(2)(B)(ii). Act’s mandatory minimum sentence of 15 years in prison. The Court of Appeals for the Eleventh Circuit affirmed. District Court and filed a collateral challenge to his conviction and sentence through a motion under 28 U. S. C.
motion and denied a certificate of appealability. Welch’s time to seek reconsideration already had expired. 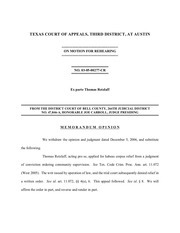 judgment of the Court of Appeals. She has ably discharged her responsibilities. issue “only if the applicant has made a substantial showing of the denial of a constitutional right.” §2253(c)(2). should have been resolved in a different manner.” Slack v.
Miller-El v. Cockrell, 537 U. S. 322, 337 (2003). would consider that conclusion to be beyond all debate. 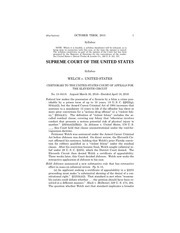 plurality opinion in Teague v. Lane, 489 U. S. 288 (1989). that assumption. See Chaidez v. United States, 568 U. S.
___, ___, n. 16 (2013); Danforth v. Minnesota, 552 U. S.
264, 269, n. 4 (2008). This file has been shared by a user of PDF Archive. Document ID: 00363789.